Okay, so when we last met up Ji Na and Tae Woon had shared a very intimate kiss. What's happened since then? Let's talk about it. As a forewarning, I have a lot of thoughts about this episode. So it's the next morning and Ji Na is berating herself for kissing Tae Woon when she has someone like Hee Cheul who's interested in her. Her weird friend/roommate, Mal Sook, gives her grief about staying out all night and asks if she was with a man. She gets Ji Na to admit that she was and admit to kissing him. Mal Sook says that means that he's Ji Na's man. Ji Na says that a kiss means nothing, but she doesn't mean it. You can see how conflicted she looks. Suddenly they hear Ji Na's mom at the door; Mal Sook told her where Ji Na was living. As soon as her mom sees Ji Na, she calls Ji Na's dad and tells him that Ji Na was happy to see her and that she asked why her dad didn't come. It was a lie, but we see that Ji Na's dad is looking fondly at a picture of Ji Na back at his restaurant. He obviously loves her a lot yet she doesn't seem all that affectionate towards him. We know from last weeks' episodes that her dad is a shareholder at the company. At the Drama Club we had wondered if he was maybe her step-dad instead, but it doesn't look like it. My guess at this point is that he walked away from a life of luxury and she resents him for making her and her mom live a life of being poor. Ji Na and her mom go out to eat and have a conversation. They are both very apologetic toward the other. Ji Na's mom asks about her dating life. Ji Na says she isn't dating. They joke about her finding a wealthy man, but Ji Na's mom tells her that it's a person's heart, not their head that's important. Before Ji Na's mom leaves she gives her a envelope of cash that Ji Na's dad sent for her. Her mom tells Ji Na that her dad loves her and thinks about her all the time, but he doesn't want to upset her by coming to visit. 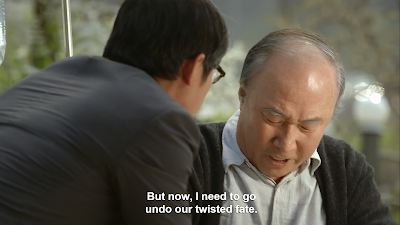 I don't know the whole story here, but my heart is breaking for Ji Na's dad. 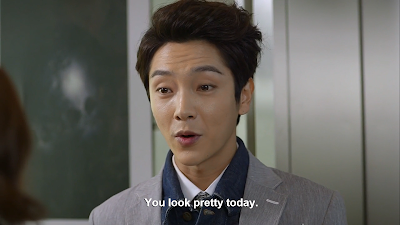 He seems like such a sweet guy, yet Ji Na pays him absolutely no mind. I hope she becomes a better daughter to him or we at least find out why she's like that. Ji Na cries after her mom leaves and was obviously very shaken up by her visit. Meanwhile Tae Woon and his weird friend are back at the flower shop discussing his blossoming relationship with Ji Na. His friend says he'll give him some advice, but from what we've seen so far he gives terrible advice. Hee Cheul hears back from his inquiry on the Chairman to learn that the Chairman has Lou Gehrig's disease. If that isn't sad enough, Hee Cheul reveals that his own father died from Lou Gehrig's. So he and Tae Woon have something in common in that they've both had their fathers die. Back at Ji Na's place Mal Sook comforts her after her mom left. Mal Sook tells her that she should be better to her parents, because it's something in life that's easy to do and it's important. Ji Na tells Mal Sook that her parents are too nice and she doesn't want to become like them. That's instead she wants to succeed and become enviable. It sounds like her parents got ripped off at some point. Maybe that's why the Chairman keeps coming and visiting them. Possibly it was him who did something to them. The next morning Tae Woon decides to throw a little celebration for Ji Na and decorates the flower shop with balloons and streamers for when she arrives. But Ji Na doesn't stop at the flower shop, because Hee Cheul told her not to. She is conflicted about it, but remembers what he says about taking it as rejection. When she gets to work and Hee Cheul sees she doesn't have flowers he's happy and tells the other manager lady that they no longer need flowers so she doesn't need to send anyone for them anymore. He tells Ji Na to leave her schedule open for that night- looks like they're going on a date. Both Ji Na and Hye Mi gives their presentations and this time Hye Mi wins. Mr. Eccentric and Oddball want to go out for a drink, but Ji Na says she's busy and they assume that she's going on a date with Mr. Unfortunate. The Chairman is back at his home and his assistant has looked into Ji Na's past for him. As he's going through her information, he realizes who Ji Na's parents are and that he knows them. We then have a flashback of him and his brother many years prior. His brother is trying to convince him not to let someone else take credit for this product that someone spent 10 years creating. In present day Chairman seems quite urgent about going to see Ji Na's parents to make up for the past. From this additional piece of information, it seems that the Chairman did do something to Ji Na's parents which is why visits them so frequently- to get forgiveness. I would be willing to bet money the inventor that created that product was Ji Na's dad. Hye Mi, fresh off of her presentation win goes to visit Hee Cheul in his office with opera tickets. He had promised to go on a date with her if she won, after all. She leaves before he can tell her that he already made plans for that night. So now he has a choice: ditch Hye Mi or ditch Ji Na. Hye Mi goes straight from his office to the roof where she finds Ji Na. They share a rather cute moment where they talk about how they could have been good teammates if they weren't put against each other. Hye Mi, who overheard Ji Na talking earlier about how she was busy, asks Ji Na if it's true that she's dating Mr. Unfortunate. Ji Na doesn't deny it and Hye Mi congratulates her. Later that night Hye Mi goes to the opera, but Hee Cheul never shows. He texts her eventually that he's busy and had a meeting, but Hye Mi realizes that Ji Na's date wasn't with Mr. Unfortunate at all. Hee Cheul picks Ji Na up and they head out on their date. He holds her hands, which startles her, and then he pulls the car over and kisses her. She seems almost frightened by the kiss, and that alone tells me that she's not really digging him as much as she claims to be. -I didn't quite need to know all those details on Mal Sook's and Tae Woon's creeper friend's love life. -Ji Na and Mal Sook's friendship is aspirational to me. They've both so up front and honest with one another, even if they're a bit cranky. -Ji Na please be nice to your parents. They're so nice and they love you so much!!! -I loved Mal Sook's line when she said "I'm going to live being content with myself." It's such a simple statement, but it's so great because all she's looking for out of life is to love herself and I think that's really beautiful and that everyone should aspire to that. -I think it's important to point out how torn Ji Na was about not going to the flower shop. -I like Manager Oh's view of competitiveness, but the fact that they're always going out and excluding Ji Na I do not like. Although she's got Oddball and Mr. Eccentric to hang out with and I guess I'd rather hang out with them anyway. -The chairman may have been a jerk when he was younger, but he really seems to be making amends. -That's pretty messed up that the Senator is laughing about the chairman having Lou Gehrig's. If I didn't abhor him before I certainly do now. -If Tae Woon's friend was a good friend, shouldn't he have told Tae Woon that Ji Na probably wasn't going to come after not showing up for hours? -Does Hee Cheul have Lou Gehrig's too? It is an inherited disease. That would be just too tragic! 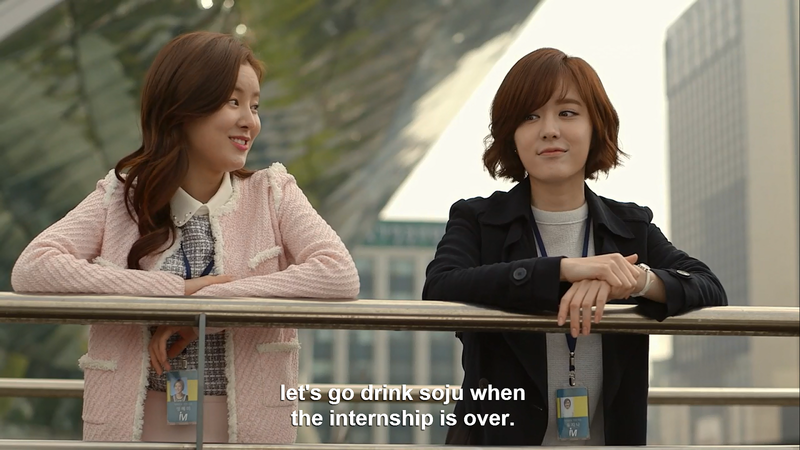 -If I've said it once I'll say it a thousand times- I love when Ji Na and Hye Mi are friendly. It brings out the best in both of them. Why can't they stay that way forever? -I actually feel bad for Hye Mi. Hee Cheul did agree to take her on a date if she won. She wasn't doing anything inappropriate this time and got totally dissed. -On the other hand I don't feel bad for Tae Woon at all that he had to wait all day. If Ji Na didn't show up in the morning he should have called her instead of just expecting her to come. -Everyone in this drama needs to know what it looks like when someone doesn't want to kiss you! I think it would save them from a lot of problems. Okay, my thoughts were a little lengthy tonight, but things are starting to get crazy! Again, you can find a link to all previous recaps below. Stay tuned for the My Unfortunate Boyfriend Drama Club on DramaFever on Thursday and then starting Friday look forward to some Producer recaps. We have a busy week ahead of us, but I'm happy to be sharing it with all my friends! Talk to you again soon! Now posted: check out our conversation over at the My Unfortunate Boyfriend Drama Club on DramaFever as we talk specifically about Hee Cheul's icky manipulation this week. Find it here.